Texting My Pancreas: Back On The Unicorn. 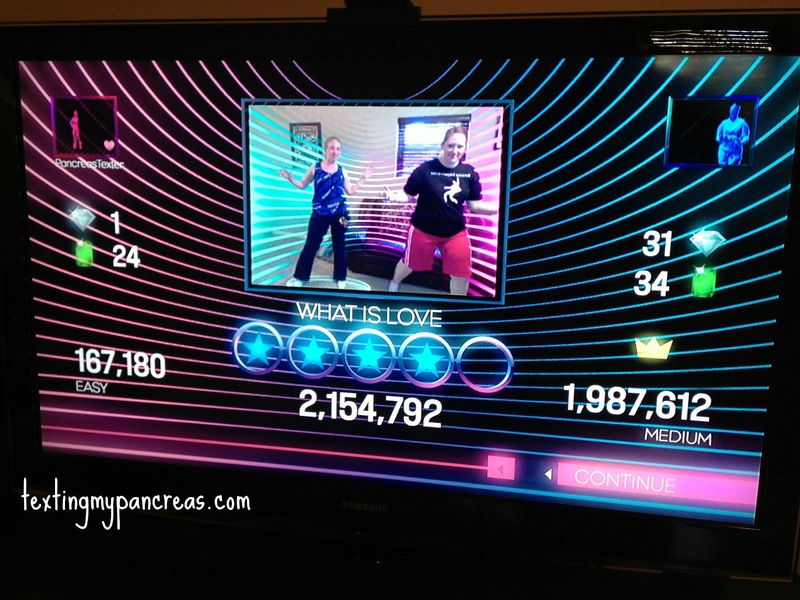 Back in the day, I had a fairly consistent workout routine in place that involved our Xbox Kinect and games like Dance Central (2 is my favorite, but 1 and 3 are pretty okay too) and Just Dance. I was able to stick with it because 1. no matter how crappy the weather might be, I could still enjoy what I was doing, 2. I didn't have to pack up a bunch of stuff or wear a backpack of some kind, 3. I didn't have to exercise in front of other people, and 4. did I mention it's dancing? It was fun, and I was good at it. I could genuinely say I liked it, and being consistent with exercise was a habit I had fallen out of, so this was kind of a big deal for me. Then I got pregnant and working out became so uncomfortable (can't! ::pant:: breathe! ::gasp::) that I just gave up for a while. And then I had a c-section and sitting up, let alone, dancing, was a challenge for several weeks, so I had to take time to recover from that. And when I started to feel like a version of myself again I just put it off, because who wants to work out when you could snuggle a baby instead? Last night was my first workout - one that would have been really easy pre-pregnancy; a 20-minute "easy start" preset list in Dance Central 2's "Fitness" option - and I did not like it. My body didn't move as quickly as I recalled; things jiggled that never did before; I felt sluggish and anything but nimble. I was uncomfortable the whole time. I felt like trying to dance in jar of peanut butter; my limbs slow to react and heavy with muscle memory loss. "But you've done this before! ", I lamented. No matter; I was starting from below zero, all over again. But I did it. I completed a workout, and I'll do it again until those feelings come back. I already feel better today (funny how that works...), and that helps remind me how important it is to make time for this each night. Go, Kim, go! I know how hard it is for me to start working out again after a break. I can't even imagine how difficult it is after having another human being. Proud of you. Don't give up! You got this. If you ever need motivation, just check out our scores in that picture.